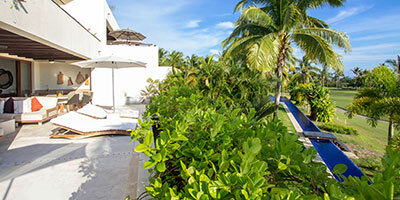 The Las Terrazas community sits on the 14th Fairway of the Punta Mita Pacifico Golf Course. The 27 boutique golf front condominiums are distributed through 3 buildings with on-site amenities including, lounging/terrace areas, and two swimming pools that are connected by a large swimmable canal. All condominiums are on a single level, B-21 is a unique three bedroom property, with a large expansive terrace, covered, and uncovered. B-21 has a designated parking space for a car or golf cart, and is located on the same level as the entrance and parking, making this property accessible for all. B-21 has been luxuriously finished and furnished by a renowned interior designer from Mexico City, bringing an enhanced level of elegance to this property. With Marble floors, and high-end appliances and finished in the kitchen, and well-appointed and finished bathrooms. Homeowners enjoy exclusive membership in Club Punta Mita, gaining access to its world class amenities including two championship golf courses, three beach clubs, a world class tennis facility, fitness center, 24/7 security, concierge service and much more. Make B-21 your new home in Paradise!